The IVFMD South Florida Institute for Reproductive Medicine serving Florida has help thousands of couples achieve their dreams of starting a family. Founded in 1991 we have seen many advances in Infertility Treatments and Assisted Reproductive Technologies. These advances have increased your chances of success and more importantly, they have helped us maintain our focus on you. Our physicians Connie Alford MD, Maria Bustillo MD, Juergen Eisermann MD, Kenneth Gelman MD, Jenna McCarthy MD, Scott Roseff MD, Enrique Soto MD, Kimberly Thompson MD and Ellen Wood DO can help you achieve your goals thru the most effective means. 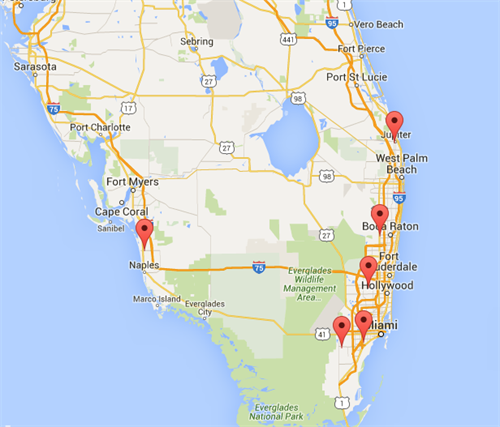 Our offices are conveniently located in Miami Dade, Broward, Collier and Palm Beach counties. Superior outcomes and easy access from Monroe, Hendry, Lee, Charlotte, Glades, Martin, St Lucie, Okeechobee, Sarasota, DeSoto, Highlands, and Indian River. Our patients seek a caring compassionate environment with superior pregnancy rates. IVF (in-vitro fertilization), ICSI, Andrology, inseminations, natural IVF, low cost IVF, Mini Stimulation protocols, fertility preservation, egg freezing, and Donor programs are just a few of the many different options you have. Call us and let us help you get started on your road to parenthood. IVFMD, making dreams a reality!